← Can there be four winners? 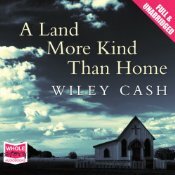 I first came upon American author Wiley Cash’s début novel A LAND MORE KIND THAN HOME being discussed as something a little bit special in audio book circles. Given that the plain old print version of the book won the UK Crime Writers Association’s 2012 award for best début novel and that it is in part concerned with one of my favourite themes (the depiction of religion in fiction) I decided it was worth a read (or a listen to be more precise). If you like accents or dialects the audio book is indeed a real treat with three equally superb narrative performances, one for each of the Appalachian residents who collectively tell this story set in a small town in rural North Carolina. Adelaide Lyle was the town’s midwife for many years and when we meet her is in charge of her Church’s Sunday school sessions. Jess Hall is the younger brother of 13-year old Christopher (universally known as Stump), a mute boy whose mother is never quite resigned to his disability and who looks to her Church, and its charismatic Pastor, for guidance. Clem Barfield is the area’s Sheriff and a man with his own painful past. Each of them brings their own memories and perspective to the sad events which take place over a few days. The choice of people to tell this story is an interesting one because although each of them plays an important role in the events which unfold, none of them is at the dead centre of the action. Although at times it seems as this might cause the reader to miss something vital because you’re only seeing things through an observer’s eyes, it soon becomes clear that this choice does allow all the facts to be revealed in a more reliable way than those at the real centre of things might allow. The combination of perspectives also allows the events to be revealed in a very deliberate and suspenseful manner. It is almost an agony at some points when a key piece of personal or town history is about to be revealed and Cash switches narrator so that a slightly different perspective can be seen, but the pay-off for riding out this drawn-out tension is well worth it as between them our three story tellers do know everything important. The ending has the kind of inevitability about it that would seem trite or forced but for the fact that the reader has been allowed to develop such a deep understanding of the story’s participants that we accept the ending as…natural. Dreadfully, dreadfully sad, but the only way things could ever have turned out knowing what we know. This is not a story for those dedicated to speed and I must admit at the beginning I was a little frustrated by the pace. Often there is but one or two sentences about the current events at the heart of the book and then a half-dozen pages of flashback to some seemingly minor happening from the narrator (or town’s) past. But it was worth adjusting myself to the pace and becoming lost in the minutiae of lives very foreign to my own (seriously I’d be hard pressed to place North Carolina on a map and small town life of any sort always has an other worldly feel to me) and in the end I don’t think there was a single reflection or memory that wasn’t relevant in some way or another. I’ve been deliberately vague about the plot of this book as I think it’s one of those cases where the less you know going in the more enjoyable your reading experience will be. If you are willing to let an author set a pace that suits the story in return for an image-rich setting and deftly teased out characterisations that are almost all heart-breaking I’d recommend A LAND MORE KIND THAN HOME. If you are even vaguely interested in audio books I’d thoroughly recommend this group narration: it’s an absolute treat. This entry was posted in book review, USA, Wiley Cash. Bookmark the permalink. I had this book on my shelf, Bernadette and I never got around to reading it. I might give it a go on audio as I may find this format better for me. Bernadette – Some stories just lend themselves to being told rather then being in print, and this one sounds like one of them. I wonder if it’s the pace of the story and the way Cash has woven in flashbacks and other descriptions that gives it that kind of effect. Interesting… The setting appeals to me too, and it sounds as though Cash does a terrific job of developing the characters. Sounds intriguing, Bernadette. I rarely, if ever, do audio books. Don’t know why. Just is. Your review of A Land More Kind Than Home makes me want to give audio a try. I am not an audio book listener. I am a reader who likes the printed page and paper books. So I may just read this book so I’ll add it to the humongous (and growing for good reasons) TBR list. Ok, you’ve sold this one to me. I’m adding it to the wish-list. I’ll be reading rather than listening then as and when. I only bought one audio book – Frantzen’s Freedom and the narrator’s voice irritated me, so I ended up buying the book instead. Conclusion being – stick to what you know!